Cleaning with the integrity and trust your banks deserve. DBS can clean your bank or credit union’s floors, counters, walls, bathrooms, windows, and air ducts. We have highly skilled cleaning professionals that are screened and experienced in bank and credit union cleaning. You can have a DBS representative visit your facility to discuss your specific cleaning needs and expectations and provide a free proposal. 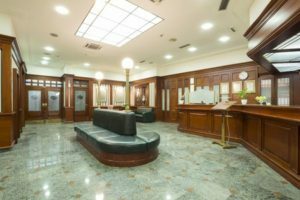 DBS can take care of all your bank or credit union’s general cleaning, floor care, and building maintenance needs. Call or fill out the form above to have a dedicated DBS representative provide a cleaning proposal for your building. As always, our promise to deliver high-quality service to your bank or credit union is supported by the fact that we do not lock our customers into a long-term contract. Instead, we offer a month-to-month agreement to provide each client with the assurance that our service professionals will provide reliable and consistent cleaning services every time we visit your facility.